Many trees and shrubs around here will die if they don’t get watered soon. People – the thrifty, the sustainability pure, and the tired – will all let low water turn into a no-water situation. Nothing can live without water! And when the plants die (it’s called permanent wilt), then the shrubs and trees will need to be replaced. And that will cost way more water, money, effort, and CO2. 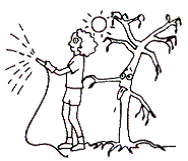 Automatic irrigation doesn’t count for watering drought-stressed trees and shrubs. In fact, they may do more harm than good by creating the illusion that watering has occurred. If you don’t believe me, go outside after the sprinklers have run and scratch up some dirt. You’ll quickly see that only the top inch of soil is wet. Under that, it is still dry as a bone! Poor trees! Big trees can slowly die over several years, disappearing as the leaves and needles drop. By the time the average homeowner notices the brown and missing leaves, it’s too late. A happy plants topmost set of leaves stand straight up. 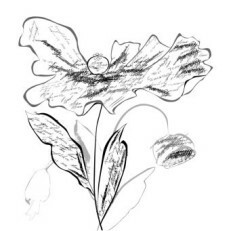 An okay plant has topmost leaves that are horizontal. A plant in big trouble has leaves that hang straight down. Please soak, soak, soak your trees and shrubs once a month. I use the flood system with a soaker hose on a slow drip and let it run a long time (1/2 hour to 6 hours) breaking the surface tension, and going deep. The goal is to keep the soil moist enough throughout the summer so that it absorbs water like a wet sponge, rather than repelling it like a dry sponge. Soils that are rich in organic material and those covered in mulch stay moist longer. In a drought situation this is a BIG DEAL. But, if you’ve been reading other posts on this page you already know that. The only reliable way to tell if you need to water is to bend over and stick your finger or a 6 inch screw driver in the ground. Ideally, you’re looking for 6 inches or more of moist soil. Tree roots are mainly in the top 3 feet of soil, most of the fine absorbing roots are in the top inches, and they extend way beyond the drip line, in your yard, under your patio and even into the street! If your water will not penetrate the soil, but just rolls off the surface, you probably didn’t get the message about mulch. You can purchase mulch and have it delivered but the mulch product I use is my own leaf litter. I simply allow leaves to stay where they fall and sweep the ones that fall where I don’t want them into my garden where they are needed. Please forward this to friends and neighbors as you see fit.